According to Dr. Johanna Youner, board-certified podiatric surgeon and a Fellow of the American College of Foot and Ankle Surgeons, the feet are the body’s tires, and as such they need to be taken care of so they last a lifetime. 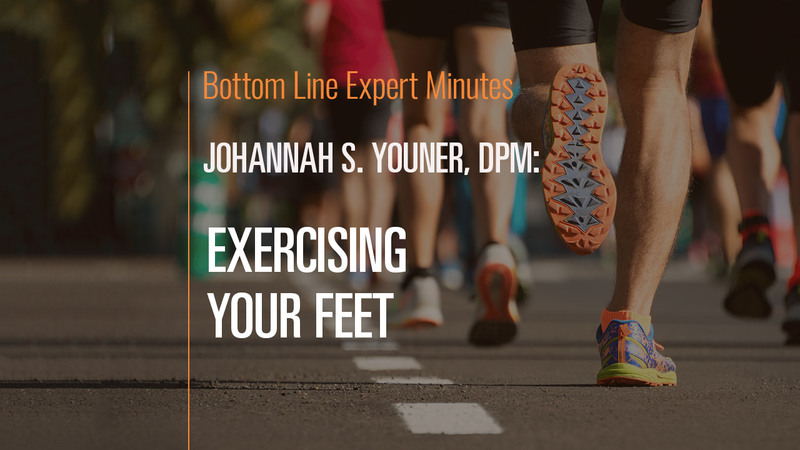 Dr. Youner offers several exercise for different parts of the foot. To exercise the toes and forefoot, pick a towel up off of the floor with your foot. Drawing the alphabet with your big toe will exercise the area from the foot into the upper leg. Toe raises exercise the Achilles tendon and plantar fascia. Ankle circles are good for the ankle as well as general foot mobility. Extending the toes releases them from a state of constant contraction. Finally, using a foam roller on the foot can ease spasms and increase circulation.